i’ve never cooked an asian dish before. ever. i even have this rule, that i will only go out for asian food four times a year. in the past year, restaurants such as stir crazy, pei wei and sagano’s have made me change the rule a little bit and this dish is definitely an exception, too! first things first. i pre-measured and mixed all of the ingredients. with the exception of the chicken, this dish cooks up really fast and you don’t want to be dawdling around measuring out peanuts when you’re trying not to burn the rest of the dish. combine chicken and cornstarch in a small bowl and toss to coat. heat sesame oil in wok over medium heat, add chicken and stir fry 5-7 min. or until no longer pink inside. add green onions, garlic, red pepper flakes and powdered ginger to the wok and stir fry for 15 sec. combine vinegar, soy sauce and sugar in a small bowl. mix well and add sauce to the wok. 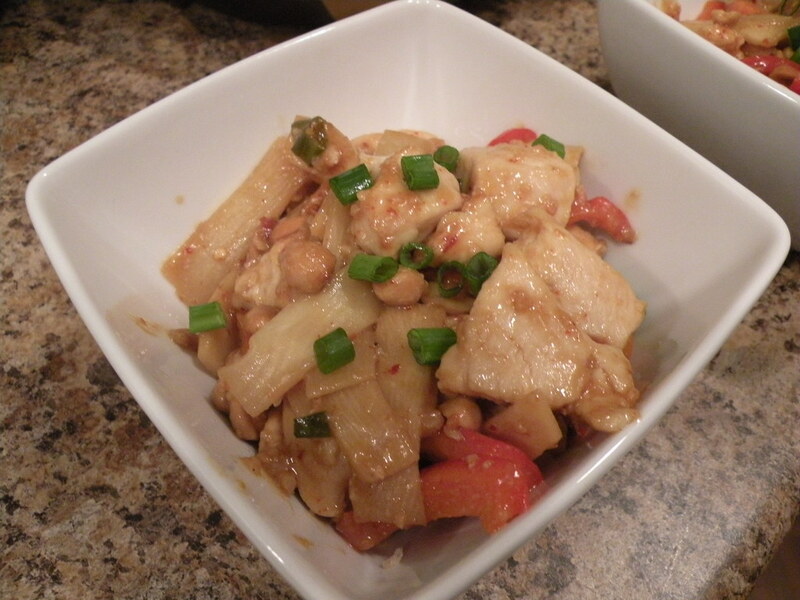 return chicken to the wok, add red pepper and bamboo shoots and coat with sauce. stir in roasted peanuts. heat throughly. top with additional green onions if desired and serve over white or brown rice.